With gentleness and respect, Kent Haruf’s Benediction examines ordinary lives in the small town of Holt in Eastern Colorado. Although this is the third book in his trilogy, following Plainsong and Evensong, this story stands on its own. Steeped in sadness with its focus on terminally ill Dad Lewis, Benediction offers insights not only into the examination of life as it ends but also into the perception of its effects on others. With simplistic language reminiscent of Hemingway and a homespun quality bordering on Garrison Keillor or Thornton Wilder, Haruf methodically records the thoughts and language of his characters. As Dad physically deteriorates, life in the little town goes on; the characters revolve around him but simultaneously keep spinning in their own orbits: Dad’s forbearing wife, Mary; his daughter, Lorraine; his long-lost homosexual son, Frank; the salesmen at his hardware store; the firebrand minister and his family; the grandmother next door, caring for her recently orphaned granddaughter; and two towns women – two good souls among some not so tolerant. Each has fears, concerns, inner demons – revealed through Haruf’s subtle interactions – yet, through Dad, their best selves come to the fore, for him and for each other. Conflicts are not always resolved, as in real life, but life goes on – the “precious ordinary.” The death of Dad comes, but the characters and their inner battles live on – maybe for another book. 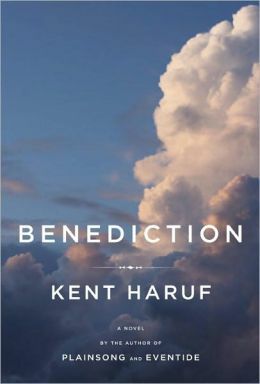 Although Kurt Haruf’s Benediction is a beautifully written testament to ordinary people, it is a difficult book to read – especially if you have a parent or loved one who recently died. Knowing the sad focus of the book kept me from reading the story for a while, even after I had downloaded it on my Kindle for a recent trip. Eventually, after reading reviews and one particular reviewer who returned to read one of Haruf’s other books in the trilogy, I decided to try. After the first 100 pages, I was hooked on the language and invested in the characters. The terminally ill father was actually a subplot – one of many on the journey of life. Haruf’s last pages, describing the death scene, however, are honest and thoughtful – but no less easy to read. Have your box of tissues nearby. When someone is miraculously saved from disaster, speculation often centers around why he survived, and how his life will affect others and the world. 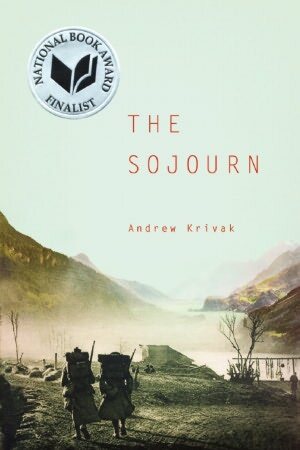 In his National Book Award finalist story The Sojourn, Andrew Krivak focuses on Jozef Vinich’s life, after his mother throws her baby son off a trestle and into the river to save him from an oncoming train. Jozef’s sojourn begins and ends in America in this coming of age tale that follows his young life through the hills of Austria-Hungary, World War I, prison camp, and back again. Jozef’s father leaves the Colorado mining town where his wife died, and returns with baby Jozef to his hometown in rural Hungary. As he grows into a boy, Jozef follows his father to become a shepherd, and acquires the hunting and shooting skills of killing animals that he eventually uses as a sharpshooter when he enlists in World War I. As the images shift to the brutal and raw horrors of war, Krivak’s descriptions vividly reveal how the war changes the boy. Rivalling Cormac McCarthy in his harsh yet simple descriptions, Krivak contrasts the savagery of battle against the intense single-minded purpose of its participants. At times, the killings and maulings are hard to read, but the language held me to the page. Jozef somehow survives the hellfire of battle, only to be taken prisoner. When, finally, he is released and sent to walk across the border to home, he confronts yet another challenge – a young pregnant gypsy girl being attacked by soldiers. The imagery shifts again – with another baby boy looking for survival. But, to tell you how it all works out would spoil the ending. It’s enough to know that Jozef’s father rescues him in the end, as he makes his way back to where he came from – his sojourn ended – his life yet to begin. Krivak’s book is deceivingly simple looking – a small paperback that can easily fit into a pocket. But the story is strong and breath-taking with images that will stay with you. The next best thing to reading a recipe book may be reading a mystery with recipes. Diane Mott Davidson dishes up funny culinary adventures with her heroine, Goldy, the Colorado caterer; the titles always have a double meaning, reflecting food and the mystery. From the first book, Catering to Nobody, to her latest, Crunch Time, Goldy is the I Love Lucy of sleuths, and cooks up some tasty dishes along the way. As she wrote more books, Davidson moved the recipes from the context of the story to an appendix at the back – so I could stop dog-earing my favorites. I still make Red and White cookies from Cereal Murders. Now I’ve discovered another source for recipes – mostly desserts. Joanne Fluke’s heroine is Hannah Swenson, the owner of the Cookie Jar bakery. Although I haven’t read other Hannah Swenson mysteries, their titles follow the tasty title formula – Blueberry Muffin Murder, Carrot Cake Murder – not as creative as Davidson’s. The first hundred pages of Fluke’s latest book, Devil’s Food Cake Murder, read like a Prairie Home Companion, as the relatives meander through their days and usually get a box of pastry from Hannah. Fluke sometime uses four or five pages for her recipes, but they are still easy, sometimes with packaged ingredients; I had to stop reading to try the Carrot Oatmeal Muffins. The dead body does finally appear, but who would kill a minister who likes chocolate cake? Of course, Hannah finds the killer after a few red herrings and with her grandmother’s help. Many of the recipes for both authors are online, and Fluke will soon be publishing hers in a cookbook, but I like to read what the characters are eating, and then replicate – without the bloody trail.